Sol Skugga is someone I need to keep my eye on. 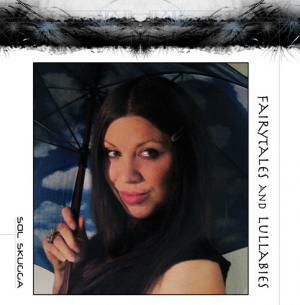 Her third album, Fairytales and Lullabies, is a well-mixed collection of electronica, ambiance, and folk. Skugga wrote, mixed, and produced her own tracks. Clearly a collector of sound, her long list of instruments include vocals, piano, acoustic and electric guitars, "electronic drums in all shapes," ambient sounds, synthesizers, samplings of Nordic nature, and rhythm instrumentation. She effortlessly merges the traditional with the experimental, topping it off with magical elements. Be still, my beating heart. The first two tracks on the album are delectable electronic songs. The third track "Burn Her" is a complete surprise; classical and Medieval sounding folk with rock elements was the last thing I was expecting to hear. Though it's completely unexpected, it is equally wonderful. "Letter To Myself" really made me want to waltz with David Bowie in a hallucinated ballroom while wearing a beautiful dress. "I Had My Share" is a folksy rock tune. I was happy that the album ended on a classical flavored note with possibly Skugga's best vocals of the entire lot. It's cliche to say that every interesting female artist to have ever existed sounds like Tori Amos and/or Kate Bush; however, Skugga's vocals did remind me of them both. "I Wanna Know" reminded me of listening to Tori Amos' "Hey Jupiter" when I was sixteen. I also felt a Madonna vibe going on, especially in "Share Tonight" and "Sweet Lullaby", when her wavering vocals were backed by predominantly electronic sound (Confessions on a Dance Floor came to mind). In any case, Skugga’s vocals are both new and familiar, often taking a front seat in her songs. On Fairytales and Lullabies, Sol Skugga has proven herself as a multi-talented, electronic musician, and modern day bard.